The remains of a distant exploded star shine like a many-hued cosmic flower in a photo that NASA released just in time for Valentine's Day. The image, captured by NASA's Chandra X-ray Observatory, shows a supernova remnant called G299.2-2.9, which lies 16,000 light-years from Earth. The object's varied colors represent different wavelengths of X-ray light. "In this new Chandra image, red, green and blue represent low-, medium- and high-energy X-rays, respectively, detected by the telescope," NASA officials wrote in a Feb. 11 photo description. "The medium-energy X-rays include emission from iron, and the hard-energy X-rays include emission from silicon and sulfur." Type Ia supernovae exhibit extreme and uniform brightness, so astronomers use them as "standard candles" to measure distances across the universe. Theory predicts that these star explosions are also extremely symmetrical, but images of G299.2-2.9 suggest that a rethink of that assumption may be in order. 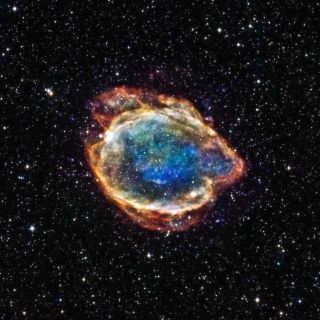 The supernova remnant is notably asymmetrical, featuring a sort of knob that extends off to the right and divergent emission in upper regions compared to lower ones (as the color differences indicate). "The patterns seen in the Chandra data suggest that a very lopsided explosion may have produced this Type Ia supernova," NASA officials wrote. "It might also be that the remnant has been expanding into an environment where the medium it encountered was uneven. Regardless of the ultimate explanation, observations of G299 and others like it are showing astronomers just how varied such beautiful cosmic flowers can be." A study describing these and other results gleaned from Chandra observations of G299.2-2.9 was published in September in The Astrophysical Journal.